I'm not sure I understand your point. How do low functioning autistic people get left behind in this? How would they be excluded from diagnosis? Myself, I'm more concerned that the way that girls present with ASD is completely left out. Again. The anxiety component, for example, is completely missing. 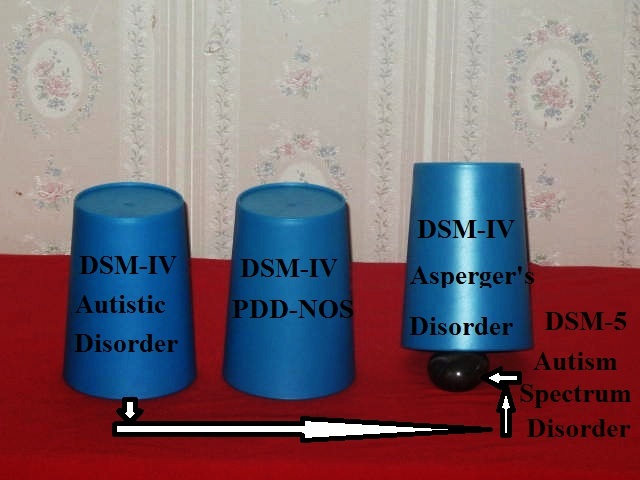 Luna, I have mentioned how low functioning autistic people are excluded from the DSM5 New Autism Spectrum Disorder in earlier posts. Low functioning autistic people are left behind because all 4 criteria for a definition of Autism Spectrum Disorder MUST be present before an Autism Spectrum Disorder will be given. While the DSM Autism Spectrum Disorder is described as a revision of Autistic Disorder it is not. It is a revision of Aspergers Disorder. The 80% of persons with DSM IV Autistic Disorder and intellectual disabilities will now be moved to a different shell ... to the DSM5's new A00 Intellectual Developmental Disorder. Whereas my youngest would qualify for the dx since his attempts to communicate, learn, grow etc are obviously impaired by the autism itself. His gains in learning and speech in the last year have been significant and leave us wondering what he does or does not know. But those with less of an ability to non-verbal or not at all communicate and no significant growth in speech over the years, would automatically be ID. This is your fear??? Not dismissing it.... simply trying to figure it out incase it ever becomes an issue. I have Asperger's, and I understand and share your concerns about the new criteria. There is a huge difference between my difficulties with social communication and the difficulties of someone with little-to-no spoken language. I mean, you don't have to have a PhD to understand that -- just an ability to observe what's going on around you and draw appropriate conclusions. Rocket science, this ain't. And tossing out autistic people with ID is also very, very troubling, to put it mildly. If those writing the DSM-V criteria want to put all of us under the same umbrella, the least they could do is to be accurate about the huge differences in the capabilities and needs of people under that umbrella. What they're done, in my view, is a major overreaction to what happened in the past. Before 1994, people like me got no diagnosis, despite the fact that having one would have been an enormous help in a myriad of ways. But now, people like your son, with much more profound challenges, will get no diagnosis at all, despite needs that go far beyond anything I've ever experienced. That's not progress. It's just substituting one wrong for another. As someone who has a child with a language disorder, I welcome this change. Children with language disorders today are almost automatically assumed to be autistic by the schools and undereducated doctors. It's hard to get children the language-focused education they need, because the schools just want to slap an autism label on them, segregate them in an autism program, and treat them with a program that's not appropriate. Been there, done that! It was a disaster. Autism is not a language disorder, and pulling that out should help identify true autism from other disorders. Anonymous, I'm not quite sure I understand... There are many other criteria for autism than language issues, and a person has to meet them for a diagnosis. If people are slapping on autism labels for people who just have language disorders, that's the fault of the clinicians, not the fault of the criteria. The problem with soft-pedaling little-to-no speech as a difficulty in "social communication" is that the diagnosis exists largely for the purpose of getting appropriate services. If the criteria specify social communication instead of a low or nonexistent ability to use spoken language, then programs will start getting tailored to people like me and not to people like Mr. Doherty's son. No one should be left out. The range of services needs to get wider, not more narrow.